Our names are Chris and Corina, and we live in Philadelphia, in the U.S. Last July, after traveling to Botswana for a family wedding, we had the opportunity to visit southern Africa and found ourselves staying at Myxos' place in Kaphunga for a week, experiencing traditional Swazi culture. One of our best memories of our trip to Africa is the time we spent at the Matjana Preschool. In the week we spent in Swaziland, we spent many days at the preschool, helping Michelle and Ncobile to teach the class, and learning things from them as well. In only a week we became very fond of the children we saw everyday, and we are told they remember us, too. Corina is an artist, and she and Michelle taught the class how to mix colours using food dye and water. She also illustrated a Swazi folk tale to be made into a book for the school. 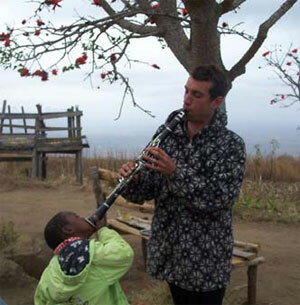 Chris is a musician and brought his instrument, a clarinet, to the school to play songs for the children. The children also learned how to make sounds on an instrument they had never seen before. We especially enjoyed learning the Swazi songs and dances that they practice at the end of the school day. The dances were very beautiful and although they tried to teach us the steps, we were not such quick learners as the children. Sifiso, who lives on the homestead and made us feel comfortable and welcome there. He was also very popular with the children, who loved to stay and play games with him after classes were over for the day. In the short time we stayed with Myxo and got to know the children and teachers of the Matjana Preschool, we were convinced that this first graduating class of the preschool will be very well prepared for primary school and for a lifetime of learning. The activities developed by Michelle and Ncobile were well-planned and their dedication to the class was apparent. We were struck by how well the children spoke English and how quickly they learned, and remembered new things. They were very curious about everything new that we shared with them. Corina, who has worked as an English teacher before in the U.S., was inspired by her experience with this class to teach again when she returned home. As tourists, we were excited to stay with a tourism company that supported community development activities. We also had the privilege to learn about Swazi life and language more directly than if we had stayed elsewhere.